Select what best describe what you are looking for in a SEO platform. Imagine what would happen if your competitors could implement powerful Organic Search recommendations significantly faster than you. Would you continue to manage SEO the way you do today? The days where you needed to wait 1-2 months for an SEO audit with an overwhelming list of recommendations, followed by many more weeks and months to implement — and hopefully see results — are coming to an end. Agile SEO requires fast, incremental recommendations and implementation. Agile is a common and very successful standard practice in professional web development. While most content management systems include some SEO capability or plugins, they implement recommendations from best practices checklists that are not constantly vetted for results. They lack the validation and strong feedback loop built into RankSense. If you don’t want to wait 6 months to see great SEO results, you need the simplicity and agility that only RankSense provides. Nobody likes to lose SEO traffic due to preventable mistakes or terrible advice. RankSense can detect traffic-killing SEO issues in real time, and send instant notifications. You have full control of the type of alerts you receive by severity, and control frequency of alerts to avoid noisy but less critical issues affecting your productivity. Monitoring your site all the time to find issues using active website crawls can slow down your site during peak user hours, and cost you extra money in bandwidth usage. 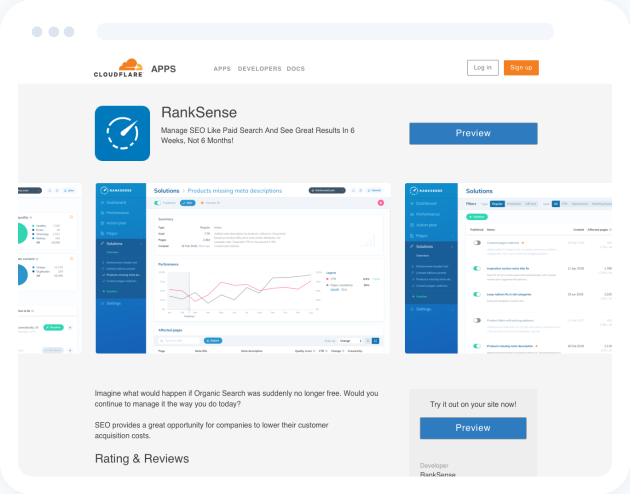 RankSense piggybacks on crawls already happening on your site, like those performed by major search engines. Review how much bandwidth is used by different crawlers and block the ones that aren’t providing any value. If there is a serious problem, you don’t want to wait hours or a full development lifecycle to correct the issue. 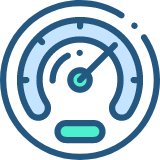 RankSense gives you the ability to patch issues quickly in the Cloudflare CDN, while simultaneously opening a ticket in your project management system to fix it. You can easily preview fixes before they go live to make sure they don’t disrupt your user flow. 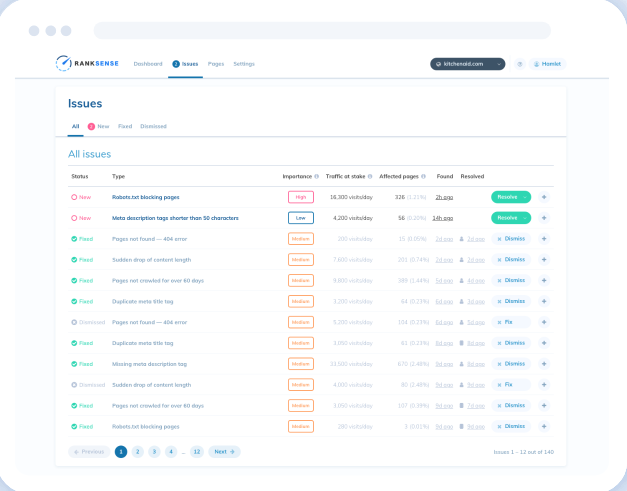 Start with our free SEO monitoring app in Cloudflare and get high impact recommendations you can implement with one click. Imagine what would happen if Organic Search was suddenly no longer free. Would you continue to manage it the way you do today? Google Shopping was free a few years ago, and most companies paid little attention to their listings. Now that it has a cost, companies make sure to carefully validate and curate Shopping like other Paid Search channels. Direct response requires personalization. Paid search is a good example of direct response in action. However, it is too labor intensive to personalize SEO at scale, even using the best content management systems. If you don’t want to wait 6 months to see great SEO results, you need the simplicity and operational capabilities of paid search. We built a sophisticated platform with that goal in mind. Most SEO best practices don’t move the needle for your site’s unique situation. Instead of spending months implementing improvements to find out what would ultimately work, start with ones already proven to work for sites similar to yours. Our clients enjoy a very high success rate because they can see what impact their changes have after Google or Bing picks them up. This saves them a lot of time and money. Implement our recommendations quickly on your site without writing a line of code. 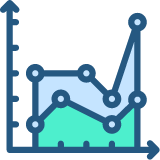 RankSense can implement changes on any platform or content management system. 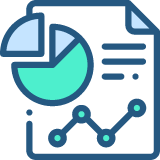 Once improvements are validated to work in Cloudflare, you can easily make a business case for IT support if necessary. If you are spending money on paid search, your paid and organic search teams can finally stop working in separate silos and learn from each other. This can help you increase sales and lower the cost of acquisition of the combined paid and organic search channels. 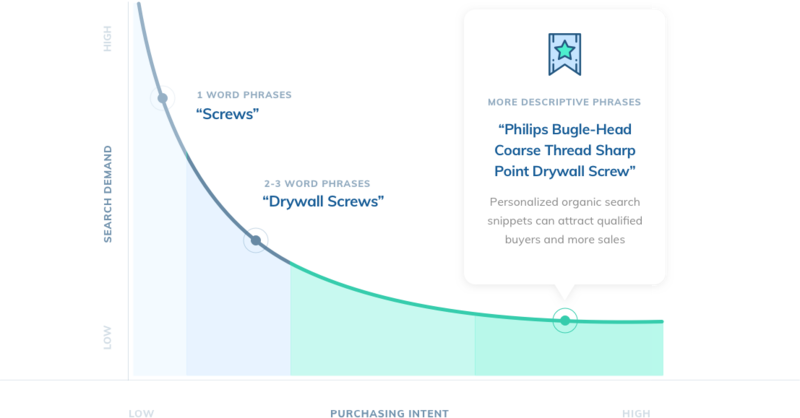 Perform advanced A/B testing on your organic search snippets to increase click through rate and results.